The PADI IE is successfully completed! 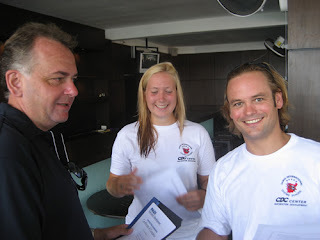 During the last three days, my two IDC candidates have successfully completed their IE on Koh Tao. 37 candidates participated and all but one were successful. 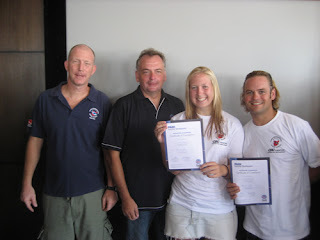 In this picture, Rob Scammell, the PADI Examiner of my two candidates hands over their Certificates of Completion to Laura in the middle and Frank on the right. Here's the official group picture, that will make it into the books, from left to right, myself, Rob Scammell, the PADI Examiner, Laura Hawkhead and Frank de Witte. Congratulations on a job well done and good luck in your respective Instructor careers.